Instead of blood pressure, temperature, and respiration, the vital signs for a forest are captured in key traits such as the amount of nitrogen in a tree’s leaves, the leaf area, or the density of the wood. These “functional traits” can impact how trees grow — and therefore how forests respond to climate change. While researchers have begun trying to tease out these patterns in recent decades, incomplete data has made it difficult to understand what’s happening to particular traits in any meaningful way — especially when you get down to the level of individual trees in a forest. To help fill this important knowledge gap, Daniel J. Wieczynski and SFI External Professor Van M. Savage, both ecologists at the University of California-Los Angeles, and their collaborators decided to analyze existing data from trait studies on forest communities to see what could be revealed about these shifts on a global scale. The team, which also included SFI External Professor Brian Enquist (University of Arizona), amassed data from 421 tree communities around the world, including information from 55,983 individual trees from 2,701 species, and examined a range of “functional traits” that influence individual growth, such as plant height, wood density, leaf area, and the amount of carbon, nitrogen and phosphorus in a leaf. To determine the climatic conditions these tree communities are living in, they also analyzed the temperature, precipitation, wind speed and vapor pressure in each one. The study — one of the first to examine how climate is influencing functional traits in forest communities on a global scale — found evidence of major changes in these traits, which could affect forest productivity and composition and even how forests are distributed around the globe. And they found that climate affects nine different traits in various ways: For example, they discovered that leaf area is most influenced by vapor pressure and temperature, while height is primarily affected by temperature variability. To the authors’ surprise, two climatic factors in particular had an outsized effect on trait diversity overall: temperature variability — not just mean temperature — and vapor pressure. They also found evidence that forests are currently shifting their traits in response to global warming. Fig. 2. 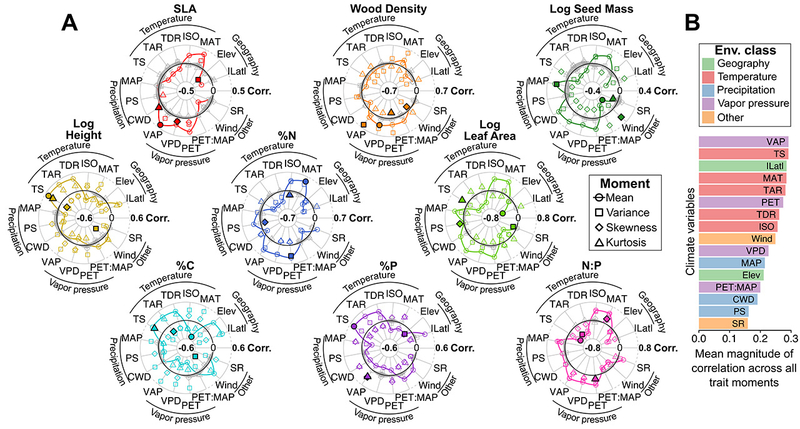 Relationships between the community-weighted moments of individual traits and all environmental variables across all forests. (A) Radar plots showing all trait moment–environment correlations. Each symbol represents a different trait moment, and its position along the radial axis indicates the strength of correlation between that moment and a given environmental variable. The solid black line represents zero correlation, the region inside (outside) this line represents negative (positive) correlations. Gray shading represents nonsignificant correlations. Filled shapes highlight the environmental variables that are most strongly correlated with each of the four trait moments. (B) Mean magnitudes (absolute values) of all significant correlations between all trait moments and each environmental variable. Environmental variables are abbreviated as follows: absolute value of latitude (jLatj), elevation (Elev), mean annual temperature/precipitation (MAT/MAP), isothermality (ISO), temperature diurnal range (TDR), temperature annual range (TAR), temperature/precipitation seasonality (TS/PS), climate water deficit (CWD) vapor air pressure (VAP), vapor pressure deficit (VPD), potential evapotranspiration (PET), wind velocity (Wind), and solar radiation (SR). “I think these results will be useful to determine climate change's effects on ecological systems,” Savage says.